Just $16.95 - $21.95 Each! 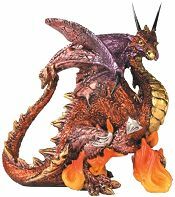 The jeweled, gold and silver accented Amethyst Metallic Dragon is a finely detailed, hand painted figurine and is a perfect addition to any dragon collection. 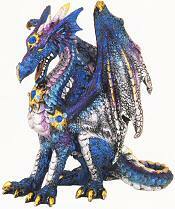 This hand painted and finished cold cast resin dragon comes in a glossy gift box with heavy foam packing. 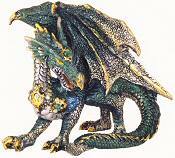 The jeweled, gold and silver accented Emerald Metallic Dragon is a finely detailed, hand painted figurine and is a perfect addition to any dragon collection. 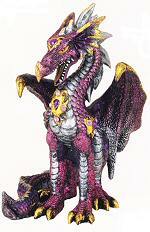 This hand painted and finished cold cast resin dragon comes in a glossy gift box with heavy foam packing. The jeweled, gold and silver accented Sapphire Metallic Dragon is a finely detailed, hand painted figurine and is a perfect addition to any dragon collection. 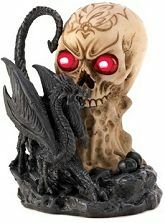 This hand painted and finished cold cast resin dragon comes in a glossy gift box with heavy foam packing. 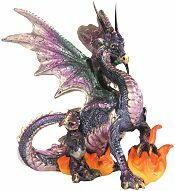 This iridescent, gold accented Amethyst Fire Dragon is a finely detailed, hand painted figurine and is a perfect addition to any dragon collection. 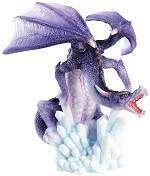 This cold cast resin dragon comes in a gift box with heavy foam packing. A purple winged, horned ice dragon protects his precious blue ice crystal lair. Vibrant icy purple scales with pale blue ice crystals. Hand painted resin and acrylic figurine.